Feature/improvement requests and suggestions: declined (55 ideas) – Welcome to the support & feedback portal for Browserism, Altunenator, & Plisterine. U understand that in the Mac App Store version it is not possible for Amphetamine to keep MacBooks awake, while the lid is closed. So why not releasing a version of Amphetamine on your website to "fix" this inconvenience of not having this possibility. There is an app "InsomniaX" which is really great at doing exactly that but unfortunately it has not the other great features Amphetamine offers, and the app is no longer developed. Sorry this is not a project I will be taking on at this time. Add the option for screen dimming after a certain amount of time? I use amphetamine mainly to keep my screen from locking, and it would be great if there was the option to still allow the screen to dim after some inactivity, so that battery is saved a bit. This is not something I plan on implementing at this time. Thanks for the suggestion. It would be nice if you could change the settings of Amphetamine by editing or replacing a file, which stores the settings. If I do this with the current version my edited file gets replaced by the old one. That would be a big advantage if you have to deploy the app on hundreds of Macs. During operation, Amphetamine mainly looks to the checkbox states and selected list items in the Preferences UI to determine its behavior. It rarely looks to its .plist for anything after launch. 1) Make sure Amphetamine is not running. 2) Use the defaults command line tool. Do not edit the file directly with a text editor. macOS now caches defaults, so changing .plist the file directly without using the defaults command will most often not work. Would be great to have the ability to automatically mount/unmount drives such as SD Cards etc when going to sleep. See Apps like "Mountain" and "Jettison"
Amphetamine is not a sleep utility, so I think I am going to decline this for now. I fear adding features like this will steer Amphetamine towards being more of a Swiss-army knife app, instead of focusing on its core job of keeping your Mac awake. Maybe someday I will reconsider. Thanks for the suggestion. Add an option to turn the Mac off after a certain set time has elapsed. I notice that when downloading from the web, if the Mac falls asleep it often disrupts the download and I need to re-dpwnload from the beginning again which is frustrating, sometimes these downloads may be bigger and rather than have the Mac awake all night for the download, a good feature would be to allow the Mac to turn off after the time limit has elapsed. Your best bet would be to set your energy saver settings to let you Mac sleep after an hour and let that kick in after a timed Amphetamine session ends. Option to choose whether keyboard backlight turns of or not whilst on Amphetamine. please add an option to suspend night shift schedule while the session is active. I’m not sure this is possible from within a sandboxed app, but I will look into it. Thanks for the suggestion. 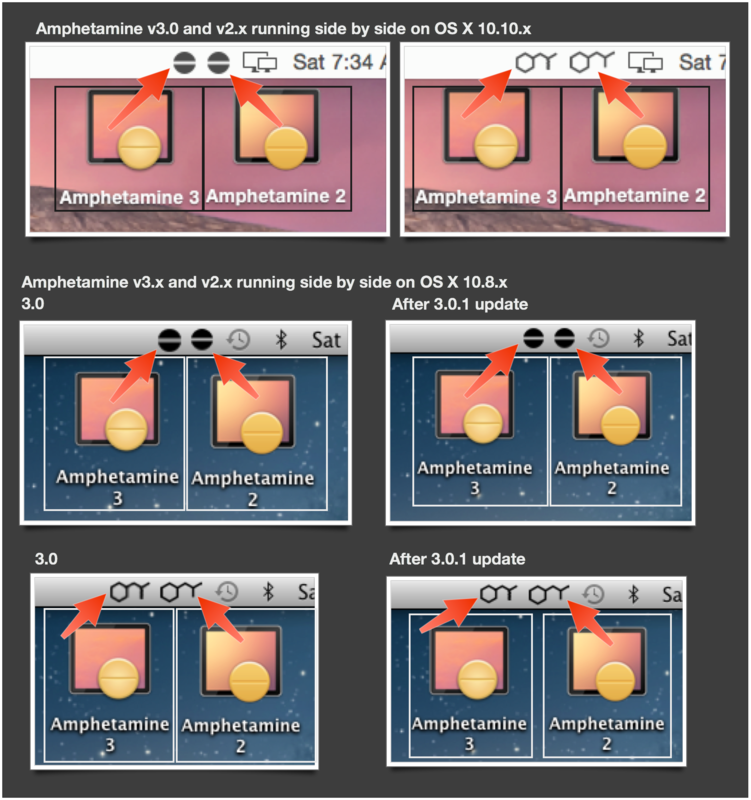 Comparing to legacy icon from Amphetamine 2, current one looks really bad on non-Retina screens. It can be clearly seen on your own screenshot http://i.imgur.com/d1arXaE.png at the botttom right corner. Could you be so kind to add back the original molecule icon, please? Then, provided you’re running macOS 10.10+ you can use the Custom Icon settings and add these icons. Lot's of times I'll give a presentation with my Mac in display mirroring. If I forget to enable Amphetamine, and I'm not actively using the computer (like if I'm answering audience questions or providing a lengthy explanation to something) my display (and the mirrored display) go to sleep. Sort of awkward during a presentation. Thanks! A great idea. I will look into how to implement. It'd be great to see Amphetamine had a trigger to stay awake when a Terminal command is running. I didn't see the application in my Terminal session show up in the application list even with "Don't show system & helper apps in list" unchecked. It would be great if Amphetamine could have a trigger for Terminal commands so that downloads and uncompressing as well as server apps via the Terminal would be supported. Amphetamine can only see certain apps/processes since its a sandboxed app. I’m considering creating an “Amphetamine Helper” app that will fill this gap. The Apps Trigger option is a good alternative but I cannot select the Microsoft Remote Desktop 8.x app. So a VPN trigger should be the ultimate solution to prevent a disconneted session. Microsoft Remote Desktop should be selectable. In my testing, it shows up just fine in Amphetamine’s app list. Please make sure you launch Microsoft Remote Desktop before trying to select it in the list. All I get is the PILL ICON (no countdown in the menu bar at all anymore - ONLY the pill icon. Have tried chosing other icons. Have quit and restarted the app several times - nothing seems to help. OS X 10.10 or higher is required for time reaming to display. I expected eventally 10.10 will be the minimum OS required. It’s rather difficult to support the older OSes as Apple deprecates older APIs and frameworks. There isn’t a really good solution for implementing this. Don’t get me wrong, I would love to add a permanent TouchBar button to turn Amphetamine on/off, but Apple won’t allow this. Only system functions can go on the control strip, and the other part of the TouchBar is context aware. Meaning, Amphetamine has to be the active application for its TouchBar interface to appear. If this is the case, seems a hot key might be just as good (which Amphetamine supports). My Macbook Air not sleeping with Amphetamine with closed lid! But WiFi goin to sleep after 30 seconds after lid is closed :( Persistent network services, like VPN, SSH, Torrent, etc will disconnecting. Please add feature to keep wireless is connected. Would be great if I could set a URL that the app would poll every X seconds and based on the HTTP response from that URL it would activate/deactivate the session. The response could be as simple as "true" or "false". I have a home office where I have several computers (mostly Macs, but Win & Linux also) and currently 8 monitors. I would like to save energy when not in the room by making all the monitors go into stand by mode. If this kind of functionality was enabled, I could have a physical switch that I switch on when I enter the room and switch off when I leave the room. This switch could be connected to my home server, which would be responsible for answering the HTTP requests of all Amphetamine's on my Macs with the appropriate status. WiFi is turned off when the lid is closed after two minutes. I want to be online with closed lid. This unfortunately can’t be done by a sandboxed app as far as I am aware. OS X handles this behavior. OS X forces a system sleep when the lid is closed, except under very specific conditions (see https://support.apple.com/en-us/HT201834). Only a kernel extension can override this (see https://code.google.com/p/macosx-nosleep-extension/). Have an option to temporarily turn on Do not disturb to silence notifications during the time frame set. If screen sharing you might not want text messages being shared with those viewing your screen. I don’t think this is possible to do from within a sandboxed application. Most system settings like this are inaccessible. Please feel free to correct me if I am wrong. Thanks for the suggestion though! Amphetamine: Show blue icon when activated. I'd like to see an option to show a blue icon (like Tweetbot when new tweets are available) when Amphetamine is activated. Why not release as Open Source? It's free software, it's a nice and simple utility so why don't open up to developers releasing to Github? You could get a lot of free help and people could learn somenthing from it. I'm currently contributing to Noti (https://github.com/jariz/Noti) and it's amazing the ideas that came up bringing more people to work together.